natural rubies | All About Jewelry! In a recent Hong Kong jewelry auction, there has been a noticeable shift in the tastes of jewelry collectors. Although there were a variety of pieces offered ranging from celebrity inspired pieces to actual jewelry worn in actual films, the star power had almost no effect on the price of these sometimes interesting collectables. At the top lot of the auction was a wonderful pair of jadeite bangles, which sold for $6.9 million to an Asian private buyer. Overall, when the dust cleared, the auction totaled $36.9 million and 79 percent was sold by value. 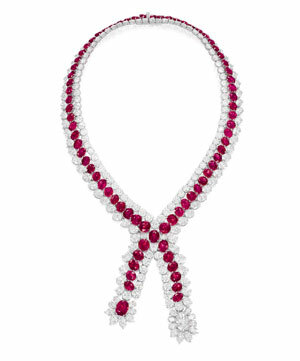 This ruby and diamond necklace (above) sold for $3.2 million, while a jadeite and diamond suite, consisting of a necklace, earrings and a ring (below), realized $2.4 million. 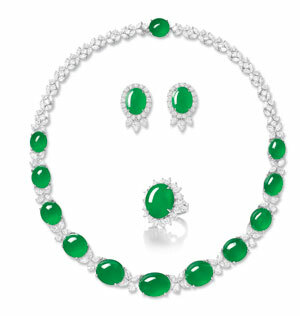 All top 10 lots of the auction, which were largely jadeite and diamond pieces, were sold to Asian private buyers.